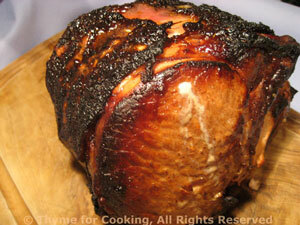 Thyme for Cooking Menus: Barbecued Pork Loin with Barbecued Potatoes, easy recipes. We did a small pork loin; enough for dinner this night and leftovers for Sunday's quiche. If you get a larger roast, use some for sandwiches - or whatever. 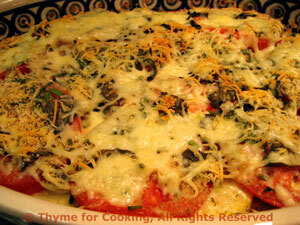 The Zucchini Tomato Gratin will be for 2 dinners. Some people eat ketchup on French Fries (chips). I prefer Aioli mayonnaise on mine.... But why not barbecue sauce on crisps? Slice potatoes the long way into 3/16 inch (.5cm) thick slices. You should get 5 - 6 slices from each potato - discard 'ends'. Mix olive oil and salt together in a wide bowl. Add potato slices and stir/turn to coat. Lay on a nonstick baking sheet (if you have one - just makes it easier) with a lip. Put in a 400F (200C) oven and bake for 30 minutes. After 30 minutes, remove pan, turn potato slices, spread a bit of Barbecue Sauce thinly over the tops and return to oven for 10 more minutes. When done, remove from pan and serve. Thin slices let the flavors meld together easily. The breadcrumbs between the layers soak up all the goodness from the tomatoes and the zucchini.... All topped with a golden, cheesy crust. This will be enough for 2 meals. Thinly slice zucchini, about 1/8th inch (.65cm). Slice tomatoes as thinly as you can, but at least as thin as zucchini. 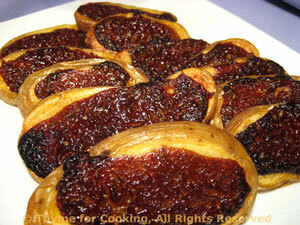 Put 1 tbs olive oil in 8 or 9 inch (20 - 25cm) square glass baking dish and swirl around to coat bottom. 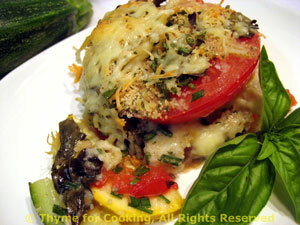 Layer half of the zucchini, then half of the tomatoes, half of the herbs, half of the crumbs and half of the cheese. Drizzle remaining 1 tbs oil over top. Cover with foil and bake in 400F (200C) oven for 30 minutes. Remove foil and continue to bake for another 15 minutes.